I love good science fiction with a consuming passion. I loved Star Trek. TNG, I mean, not TOS. Kirk blows, Picard rocks, game over. I didn’t hate DS9 after the war with the Dominion started, Voyager worked after Seven came on board, and Q has all the best lines whatever quadrant he’s in. And as regular readers of this blog already know, I loved the new Star Trek Film. 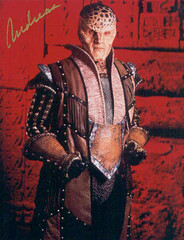 I loved Babylon 5. G’kar and Londo’s relationship is one of the all-time best love stories ever written, I am still deeply in lust with Garibaldi, and the Shadow story arc that lasted the life of the show was genius. I actually wept when Sheridan went into the light, and I hatedhatedhated it when Boxleitner took over for O’Hare. If I ever meet J. Michael Straczynski in person, I will kiss him on the lips. There are also some very good B5 books by Peter David. Now I’m suffering the separation anxiety that came with the end of Battlestar Galactica, one of the best shows in any genre ever on television. For one thing, my god, the cast! The gravitas Edward James Olmos, Mary McDonnell, Michael Hogan, Katee Sackoff and the rest bring to their roles is devastatingly convincing. For another thing, the writing! If I ever write a whole book as good as just one episode of this show (“Occupation” — “Take your time,” Starbuck says, and cuts her steak with hands still wet from the blood of the Leoben she’s just slain. Shriek!) I will die a happy woman. I even listened to the Galactica Watercooler podcast. I read sf, too. Over the years I’ve been slowly collecting all my favorite Heinleins in hardcover (not firsts, can’t afford ‘em, but the Scribner, Tor and Ace reprints), and I advocate the work of Steven Gould like it was my own. So that’s it, that’s my dirty little secret. I’m a geek. Can I be a geek if I’m a girl? For a woman who can be so smart, sometimes you’re just so, so….dare I say it, dumb? Humbled by your reproof, O Anonymous One, I shall go forth and embrace my inner geek forthwith. I feel the same way about Stargate. As much as I wanted to love, it just never caught with me. Dana, why aren’t you writing sci-fi again? I’ve watched your reading recommendations and it’s clearly your first love. Or are you working on something in secret? Shh…I won’t tell anyone. @Sean I had three more books in the Star series planned but at this point I don’t know if I’m ever going to get to them. For one thing, my sf did not sell well, and publishers don’t line up to throw good money after bad. @Lori Must have had a brain cramp when I substituted “file cabinet” for “lockbox.” Pretty much all I can do is apologize that nobody picked up on that. It happens. @Tan Thanks for the tips, I’ll go find the Gerrold series immediately. It’s hard when a favorite series has ended. I am so happy you love Heinlein! Do check out Spider Robinson (his Callahan’s stuff, and Stardance series. I’m a bit ‘meh’ on his finishing of Heinlein’s ‘Variable Star’, myself) and for the love of all that’s holy, read David Gerrold’s ‘War Against the Cthorr’ series as soon as humanly possible. A word of warning- the series is not yet finished, but it is so superb that it doesn’t matter. C.J. Cherryh’s ‘Chanur’ series is brilliant. Geek is chic. People can only -wish- they were as cool as us. and ending with Northern Girl? Wonderful. just the best. I still re-read them when a need a comfort get-away-from the present-day read.